Our daycare is unique in that we offer a service completely different to any of the competition. All our team are highly experienced and qualified dog trainers, and we dedicate our time to making our daycare guests' days educational as well as fun. It's because of this that unfortunately we currently have no availabilty for any more dogs to join us in daycare. We have a strict admission policy in place and should a place become available, we insist that any new dogs must complete either Puppy School or our PRO Dog Level 2 course of training classes as well as a short induction, so that we can reliably assess your dog's suitabilty. If you'd like to join our waiting list or just find out a little bit more about how it all works, just drop us a message using the contact form in the menu at the top of the page. More trainers than you can shake a bone at! We love dogs as much as anyone, but love alone isn’t enough to keep dogs safe and happy. That’s why our team are experienced, professional dog trainers, allowing us to keep an eye on body language, step in well before conflicts start, and make sure your dog’s playmates are a perfect match. Because we get to know all of the DW dogs, you can be sure every friend your dog makes here has met our standards for polite, safe play. Add experienced staff actively overseeing all play and you’ve got a great recipe for safety. Our high staff-to-dog ratio means we knows every DW dog inside and out—and that means customising the perfect daily experience for every one of our guests. 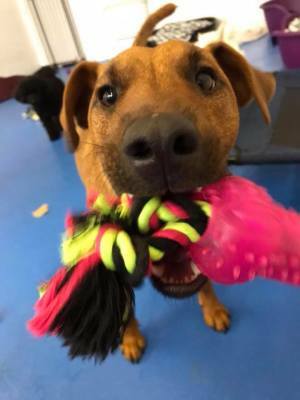 If your dog is lucky enough to be already a part of our Daycare Club and you want to make a booking, please click on the box below to log in and book your days!